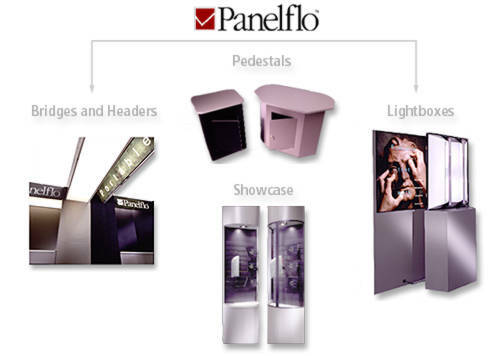 With Panelflo you create a display tailored to your needs. You get a "custom-looking" fabric or laminate exhibit designed to fit your specifications-whether it is a lightweight tabletop unit, a portable 10 ft. display, or a sophisticated island configuration. Best of all, there are no loose parts, no tools required, and every component is reversable and re-configurable. Thousands of display solutions are possible, simply by rearranging panels, substituting components, and selecting from a wide palette of fabric and laminate options. As your needs change, Panelflo is designed to change with you. 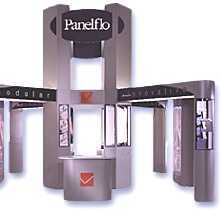 Modular versatility maximizes your display investment while maintaining a recognizable show-to-show presentation. You remain portable in function without appearing portable. 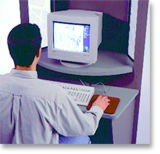 intex exhibit systems CAD designers are ready and willing to create a unique modular design specifically suited to your needs.